Since I am partially colorblind, I have never felt quite as confident with painting as I have with drawing. Even so, I was more pleased with the way this painting of my father turned out than any other painting I have done. By the way, my father is Austin, not Alice. Painted in 1982 (I think), the painting was an experimental oil painting. I had never painted a portrait before that was set in a natural background. Up until that time, all my paintings were fantastic and dealt with imaginary beings and settings. 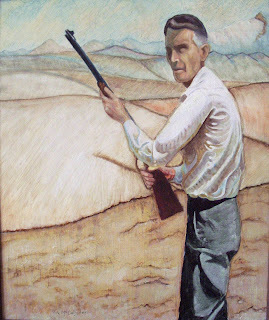 This painting of my father was inspired by a photograph of him out in the Mojave Desert, which was one of his favorite places to be. It captures him well and anyone who knew him would recognize the likeness and the appropriateness of the setting. I may have tried to incorporate too many different influences but even twenty-five years later I still find the combination pleasing. The upper background was prepared with a textured gesso and the painting was inspired by Monet. For the foreground I prepared my own mixture of Japan drier and gesso that forced the surface to crack, which was painted over with a wash so that the paint would seep into the cracks to give them definition. The painting of my dad is not as crisp nor as precisely stylized as Struzan's but it was the main influence to the style. 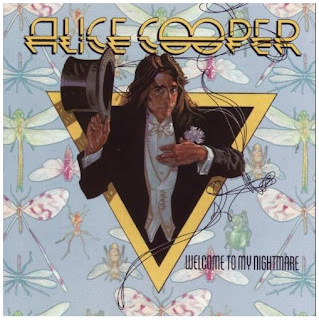 Due to the informal setting of my father's portrait, in contrast to the formal setting for Alice Cooper, I rendered the lines in my dad's shirt more organically and not so rigidly as in Alice's tuxedo. For me though, the best thing about the painting is not who influenced my technique; it is that it reminds me of the person who most influenced my ideal for character and integrity.